1800wheelchair was created with the consumer in mind – they were the first company to supply medical equipment and mobility scooters online in 1998. Although many companies now offer products online, they still have an advantage in the mobility scooter industry, offering a larger amount of scooters than their other providers. While competitors may only offer a few, 1800wheelchair has 39 different three-wheel and 45 four-wheel scooters that range from around $700 to over $4,000. The website divides them further for easy searching based on price, weight capacity, brand, and based on utility (portable, indoor, outdoor, or heavy duty scooters). 1800wheelchair doesn’t provide their own scooters, rather, they work with manufacturers like Pride Mobility, E-Wheels, Golden Technologies, and more, to provide such a wide selection. All of the scooters come with a manufacturer’s warranty, so what’s covered tends to vary. Usually, the frame is covered by a 2-year warranty and many of the motorized parts, like the brakes or wheels, come with about 3-month warranties. Although always innovating, they now provide five different types of three-wheel scooters, and six different four-wheel scooters, which vary between lightweight, heavy duty, and all-terrain designs. The cheapest models are lightweight and come in around $750 while the most expensive is the heavy duty scooter at $3,949. Unlike some mobility scooter providers, 1800wheelchair has been accredited by the Better Business Bureau since 2005 and has maintained an A+ rating, making sure to close all their complaints. Customer service is easy to reach and speak to. They provide helpful information over the phone or through an online chat, and communicate by email as well. If you are just looking for more information or have questions about their products, it’s easy to get on the phone without having to deal with a hard sell. However, after the initial contact problems may arise. When complaints aren’t about faulty equipment, rather they are due to return and refund issues and delays. If a product doesn’t meet the requirements of the user, or an error was made in shipment, it takes a long time to receive a refund and return the product. Many people report being given the run around – customer service representatives don’t respond or call back or say warehouses are closed or the website is down for maintenance. Although some delays are reasonable it certainly seems suspicious that so many people have run into similar issues. Other problems may arise from miscommunication between 1800wheelchair and its manufacturers. They may not always have the most up-to-date information about products or manufacturer policies. 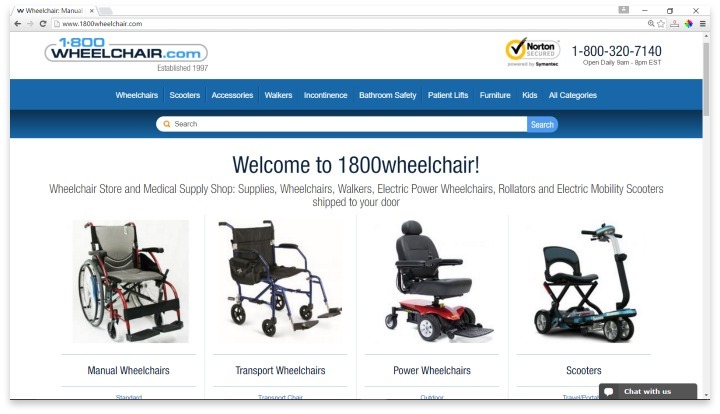 1800wheelchair.com works with many manufacturers to provide a wide selection of scooters. All of the scooters come with a manufacturer’s warranty. 1800wheelchair seems like it might be a good option, but in the end, it is a middleman. Unless the prices are cheaper than what the manufacturer offers, it might make more sense to deal directly with the manufacturer, especially since you will have to contact them if you experience any technical issues anyway. As for refunds or returns, working with 1800wheelchair to reach a solution might just be a hassle. Have you had an experience with this company? Please share your 1800wheelchair.com reviews below. Horrible and unethical business practices. No wonder BBB revoked your accreditation and rates you as an F.
+ PROS: Horrible and unethical business practices. No wonder BBB revoked your accreditation and rates you as an F.
- CONS: Horrible and unethical business practices. No wonder BBB revoked your accreditation and rates you as an F.